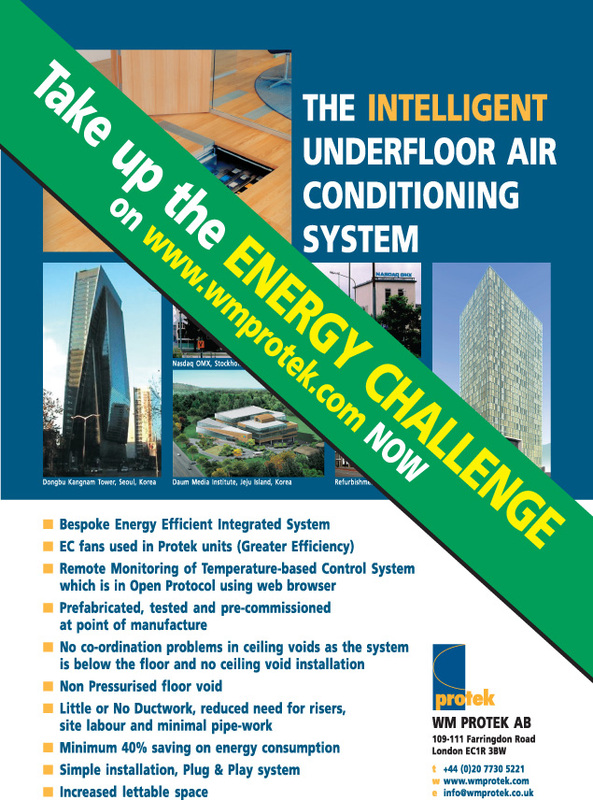 The Protek Underfloor Air Conditioning System is a proven, extremely energy efficient system, using appreciably less energy than Fan coils or VAV. The system also adds value to the property as additional floors can be achieved without increase to the overall height of the building, due to reduced ceiling space required and most of the service floor plant rooms for air handling can be converted to additional lettable office space without major investment costs. The design criteria set out below is for an actual project and the energy figures are based on actual figures achieved, measured during the follow up of energy consumption performance on Protek delivered projects. We challenge you to put forward a design for the same structure using Fan coils or VAV that is more energy efficient than the Protek System. This particular building was designed for 31 floors, but having used the Protek system, an extra six floors were converted from plant room** space without increase to the height of the building. CO2 Control of Outdoor air volume Yes ? (Protek low pressure OA AHU units per floor in risers) 285 kW/h ? 111 No. Zone Units for indoor distribution (12,200 m3/h) 2,873 No. RAG units 256 kW/h ? Total energy per working hour 541 kW/h ? Say 2,500 hours/pa 1,352,500 k/Wh ? kW/h per m2 16.83 kW/m2 ? The challenge is to complete the blank space with proven data for VAV or Fan coils, with Central OA AHU and fan driven VAV boxes or fan driven fan coils. But we challenge you to improve on our ENERGY EFFICIENT SYSTEM! The challenge starts on 14th March 2010. A prize of £1,500 will be presented to the entry which shows the LOWEST energy solution. The Jury: An Independent panel. The Winner will be announced on 29th May 2010.